Please leave a comment with the books that you read. For those with blogs: please write a completion or update post which list the books you read and any other information that you would like to share. Oh, it’s okay that you competed four. There;s always the 2016 challenge :). Thanks for participating. And I would love to guest blog for you. Happy reading in 2016! Guest blog for me? How nice! You mean passing around word of my groups in some way? I’d love to hear your ideas and I’m certainly in the middle of written my 2016 themes up. I am very happy to try again with African content. Hugs from prairie Canada, Carolyn. Please send me your 2016 link. I didn’t see it. Where I did find you is at Goodreads! I got to see how you look. 🙂 Also please know I corrected my spelling of “Ghana” at my challenge post. I finished Zoo City, which I would never have heard of if you hadn’t listed it on your challenge, so thank you for that. I reviewed it here: https://maamej.wordpress.com/2015/02/02/zoo-city-music – and now thinking about what to read next. 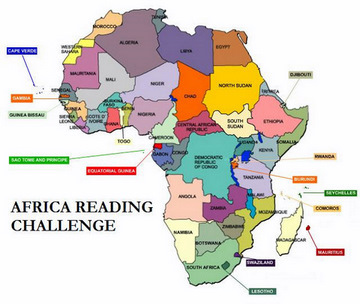 I read a total of 23 books by African authors for this challenge. In past years, I have focused on books by African women, but this year I branched out. As always, I loved some of the books by women that I read especially, The Moor’s Account, by Laila Lalami, and Distant View of a Minaret, by Alifa Rifaat. More surprisingly, among my favorites were Wizard of Crow, by Ngugi wa Thiong’o, a man from Kenya and Burger’s Daughter, by Nadine Gordimer, a white African woman. Here is a list of all the books I read for this challenge. Thanks to Kinna for hosting it and to all of you who contributed to my ever-growing pile of African books I want to read. ***The Moor’s Account, by Laila Lalami. ***Distant View of a Minaret, by Alifa Rifaat. Sweetness in the Belly, by Camilla Gibb. Secret Son, by Laila Lalami. Zenzele: A Letter to My Daughter, by J. Nozipo Maraire. On Black Sister Street, by Chika Unigwe. True Murder, by Yaba Badoe. Tropical Fish: Tales from Entebbe, by Doreen Baingana. Hope and Other Dangerous Pursuits, by Laila Lalami. Ancestor Stones, by Aminatta Forna. In Dependence, by Sarah Ladipo Mayika. Dilemma of a Ghost and Anowa, by Ama Ata Aidoo. Daughters who Walk this Path, Yejide Kilanko. ***Wizard of Crow, by Ngugi wa Thiong’o. Death and the King’s Horseman, by Wole Soyinka. July’s People, by Nadine Gordimer. The Bright Continent, by Dayo Olopade. New News from Africa, by Charlayne Hunter-Galt.